In May, three high-profile representatives of the arts world will shortlist the winning entries to The Woon Foundation Painting and Sculpture Art Prize, first launched in 2012. 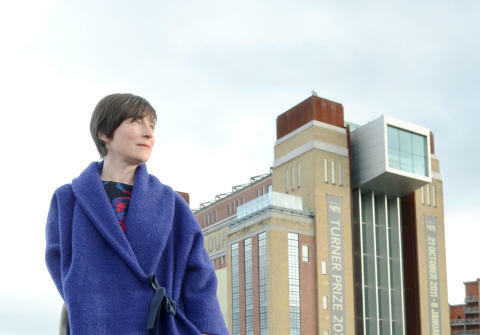 The judging panel will be chaired by Turner Prize-nominated artist and BALTIC Professor Christine Borland, and comprises a wide range of artistic and cultural expertise and experience. Professor Borland is an artist with a global reputation for collaborative, interdisciplinary practice-led research involving science and medicine. Her work explores the ethics of art, medicine and science from contemporary and historical perspectives. Francis McKee, Director of the Centre for Contemporary Arts in Glasgow, and lecturer and research fellow at Glasgow School of Art. The Woon Foundation Painting and Sculpture Art Prize was established to provide opportunities for students to develop their fine art practice, offering direct links with the cultural sector through Northumbria’s award-winning partnership with BALTIC Centre for Contemporary Art, Gateshead. The annual competition is open to all final year Fine Art students studying in the UK and offers a prize total of £40,000 to winners and runners up, made possible by keen art collector and Northumbria University Law alumnus Mr Wee Teng Woon. 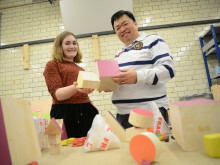 er, Holly Hendry (pictured with Mr Woon), received a £20,000 bursary to fund the cost of her one year Fellowship at the BxNU Institute for Contemporary Art at BALTIC 39 in Newcastle. Holly’s fellowship will draw to a close this summer but she credits the Woon Art Prize for providing her with a unique opportunity and platform to develop her practice. 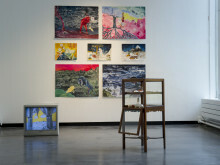 Since winning the prestigious award and studio space in BALTIC 39, Holly has exhibited work in Northumbria’s Gallery North, as part of the Woon Prize exhibition, and will present her solo show there in September. Her work has also been displayed at The Royal Standard in Liverpool, The Bank Gallery in Whitechapel, London, and the BALTIC 39 open studios event . She was also included in The Catlin Guide 2014 – an annual publication that highlights the talents of just 40 graduating UK artists. 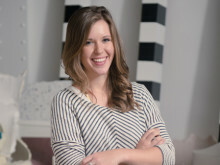 Holly’s current installation, entitled The March Project, is being exhibited in Sharjah, United Arab Emirates. Commissioned by the Sharjah Art Foundation, the sculpture is influenced by traditional Arabic architectural techniques and plays with the old and new forms of air conditioning, addressing air as a life system that is processed through buildings and bodies. 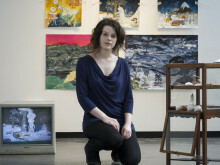 Holly, a Slade School of Art graduate, said: “Winning the Woon Foundation Art Prize has made everything possible. It’s provided me with the resources, time and studio space to make. “I’m enjoying being in Newcastle and experiencing a new art scene that’s so far away from London but exciting in its own right. “Being part of BALTIC 39 is a really eye-opening experience. It’s great to meet the curators from BALTIC Centre for Contemporary Art in Gateshead and all of the people involved in making exhibitions happen. It’s been really good to see behind the scenes. The winner of The Woon Foundation Painting and Sculpture Art Prize 2013/14 will be announced on 16 September, 2014. The overall winner will receive mentoring from BALTIC Professor Christine Borland and a £20,000 bursary, which funds the cost of the Fellowship at Northumbria University. They will have access to dedicated studio space in the BxNU Institute of Contemporary Art in BALTIC 39 in Newcastle and exhibition space to showcase their work produced during their Fellowship. Two other major awards of £9,000 and £6,000 are available and two consolation prizes of £3,000 and £2,000 will be awarded at the discretion of the judging panel. For more information about The Woon Foundation Painting and Sculpture Art Prize, visit www.northumbria.ac.uk/woonartprize.